American rapper known for songs such as Check and Halftime. A rollingstone article called him "six feet three, ridiculously skinny". Thug is definitely 6’3 at least. The cole photo is weird yes, but I’ve been a young thug fan for years and he is always the tallest in almost every single picture I’ve seen of him. There’s also a pic of him with Snoop Dogg where you can see their footwear and they look the same height. 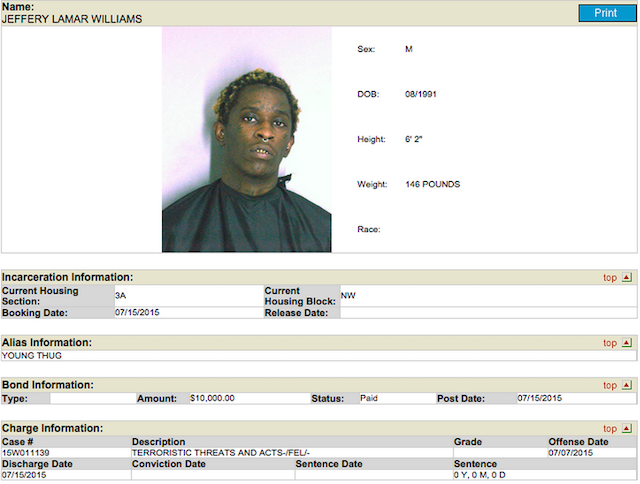 To be fair, Thug never seemed 6'3 over a 5'9 Rich Homie Quan, anyways. He always looked about 6'0.5 through maybe 6'1 with him. He looks somewhere around that next to J. Cole. Definitely would not pit him over 6'1, though. He's either a tiny bit shorter than that or J. Cole is a tiny bit taller than 6'2.25. But even then, that's all ignoring the photos with Colin. Colin either has a crazy footwear advantage in those pics or he would have to be quite a bit over his 6'4 listing to be pulling even that much over a 6'2 J. Cole, so these two(And by extension, a few others) are probably quite a bit shorter than even this. Guys, young thug is not 6’3. I Cole is also not 6’4. Cole took a pic with Colin kaprinick where he looked much shorter than Colin he is a legit 6’4. Maybe 6’4 and a half. So who is lying? A lot of these rappers who claim 6’3 and 6’4 are actually strong 6’1 and 6’2s with Jordan’s on. It’s easy for me to see because I played basketball and was around huge people all the time. Young Thug either needs a downgrade or J. Cole needs an upgrade because the picture with them standing next to each other is very telling of that. In the photo, J. Cole clearly looks taller (about 1-2 inches). I’m thinking Thugger could be under 6’3” (strong 6’2”) while J. Cole is 6’4”. his shoe size is 8.5 at 6'3+. it's crazy. Common Rob, please give him the upgrade. If anybody here doesn't believe me, take a look at his music video for Guwop. Seriously towers everthing. Looks a legit 6'4 in that video. I like his name! He is probably about said height! Future taller than young thug? Lmao and I guess future and Snoop Dogg are the same height right? There is a fresh video of Future and Young Thug in New York doing shopping. Future looks taller than Young Thug. So Thug is same as Future at best. This was the pic I tried to send in the comment below. Doesn't look like a 1.25 inch difference and I doubt young thug has footwear advantage. Hey rob do you think snoop has an edge on him? They look similar. He looks 6'3 1/4" 191 to me. Editor Rob: Thug can pull off a big 6ft 3 range, with Snoop he might not look much different really, though I believe Snoop has a better chance of measuring taller. 6'3 is the lowest he can be. 6'3.25, which is his average guess, probably would be better for him. Maybe even 6'3.5 once 2 chainz gets another upgrade. Thug looks 1 inch at most shorter than him here and 2 chainz always wears at least 1 inch footwear. What do u think rob? Rob,how tall do you think the guy in the red hoodie is? He has claimed to be 6 foot on numerous occasions. Editor Rob: he seems a bit under 6ft there. I could imagine him and Wiz khalifa being the same. What do you think about this mugshot that list him at 6'2 ? It is a real mugshot ? Editor Rob: in 2014 Thug had an arrest record with height 6ft 3 and 140 pounds...I don't know about the 6ft 2 one though, seems a bit short! How tall would you say rapper Quavo is ? Editor Rob: not so sure on him yet. He's showing great posture in photo and I like his red shoes....yep 6'3 he is. Definitely short legs relative to his height. Has he got short legs? Looks even taller in the above photo, I could quite believe 6'4 range.